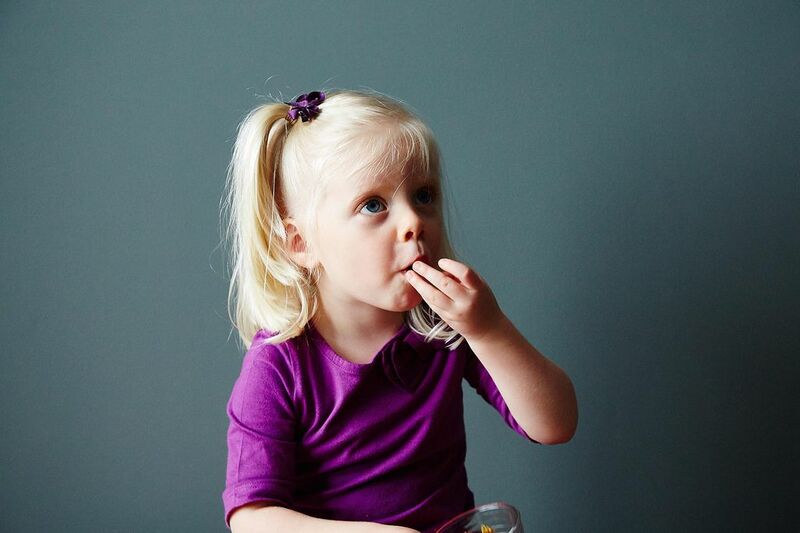 Merrill's daughter Clara has quite the appetite -- and it's all Merrill can do to keep up. Armed with her greenmarket bag, a wooden spoon and a minimal amount of fuss, she steps into the fray. Today: Clara's love for muffins is well-documented and now, she's venturing out on her own and baking a batch herself (...sort of). It's a new year, and Clara is about to turn three. She's also about to get a baby brother (due to make an appearance in early February), and she's feeling excited and proud about being a big sister. Apparently, she's most looking forward to teaching her brother how to eat pizza. I told her she might have to wait a bit. We got Clara a "big girl" bed back in November and moved her crib and changing table into the baby's room. She brushes her own teeth now, puts on her own shoes, and carries her own backpack. Naturally, I decided it was high time to get her started in the kitchen. I gave her this stool as a Christmas present so she could belly up to the kitchen counter with me, and my mother gave her an apron. We made Secret Cookies twice (she pressed a whole tray with colored sugar all on her own), and then biscuits. Now every time I pull out my cutting board, she says, "Mama, can I help?" More: These aprons, stools, and finger puppets will get your kids excited to pitch in in the kitchen. Over Christmas, Clara tried her first corn muffin and loved it, so this past weekend we made our own. I asked my sister, an expert on cornbread, for guidance, and she pointed me to Fannie Farmer. 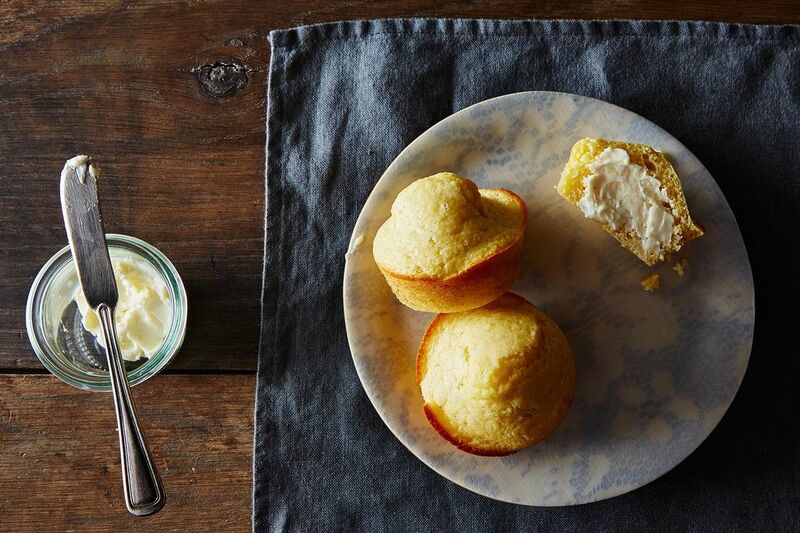 I like a middle-of-the-road cornbread -- not too sweet, but not completely savory -- and slightly cakier than not. With lots of salted butter, of course. Clara and I measured and mixed, and in about 20 minutes we were spooning batter into muffin cups (well, she was spooning batter more over and around the cups than into them). Fifteen minutes later, we watched impatiently as they cooled on a rack. When we couldn't stand it any longer, I took two still-warm muffins, spread them thickly with butter, and we sat down at the table to eat them together. Neither one of us left even a crumb. These muffins are tender and full of flavor, with just the right heft, and they'd be great with everything from chili to roast chicken (which we had them with). Clara has eaten at least four since the weekend, and she's told anyone who will listen that she made muffins herself. If you've had great success making a particular recipe with a toddler, please let me know in the comments -- now the pressure's really on. What recipes have you made with toddlers? Share with us in the comments below! Congratulations on the soon-to-be new addition to your family. What a lucky baby! At three I was cutting out Christmas cookies, but my great-nephew -- my most recent experience with toddlers in the kitchen scrambled his own eggs! it's almost impossible to find sour cream in where i'm at. is there a replacement for sour cream? heavy cream? Congratulations Merrill! A cookbook that both my children started with early on and still love is Molly Katzen's Pretend Soup. I bet Clara would enjoy making the popovers. When my girl was that age her favorite part of recipe prep was squishing up whole plum tomatoes for sauce, but she also helped stretch pizza dough, shape focaccia, cut fat into flour with a pastry cutter, etc. Pretty much anything that wasn't done with a knife, at a hot stove, or with expensive/irreplacable ingredients was up for grabs. She's 10 now, and has long since branched out into other areas, but it's still fun to see how excited she gets about good food. Bonus? She shops, preps, and packs her own lunches, which gives me an extra 15 minutes of sleep every morning. Excellent news, Merrill. Congrats to you all. I have a "cookbook" both my kids made when they were in preK called Alphabet Snacks. Each week the kids would make a snack beginning with a letter of the alphabet. One of my faves was the XYZ Cake (extra yummy zesty cake). You can find it here in the archives. I highly recommend the kuhn rikon kinderkitchen line of kitchen tools for children. I got my son the dog knife a few years ago (he's 6 now) and he uses it to help with meal prep. Today he cut up carrots and potatoes for pot roast. The knife cuts really well but isn't sharp or dangerous for little hands. First: Huge congratulations! I'm sure Clara will be an excellent big sister. Second: if there was anyway I could get one of these muffins in my belly this very second I'd be in heaven. And, congratulations about the new baby! so exciting! Hi Merrill, my daughter is turning 2 in April and so far she makes her yogurt-granola-maple syrup breakfast. I got her to help me make rice and she tried to eat it raw... oops. She helped me make egg salad the other day -- she cracked all the eggs and helped me peel them and helped stir it all together. Have you tried the yogurt cake from Bringing up Bebe? I was thinking of trying that soon. Congratulations! I had a great time making Brazillian brigadieros for Valentine's Day last year with a particularly industrious 4-year-old... rolling truffles feels a lot like playing with play-doh, when you get down to it. Congratulations Merrill! Such wonderful news. Wishing you and your family all the best. My son turned 3 a couple months ago and will have a baby sister in early march- he loves talking about all the foods he will introduce to her!